Home›News & Events›Innovate and Impact Bursary Programmes – 2019 applications open! Innovate Programme – applications open! 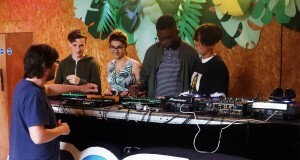 We are pleased to invite applications for Innovate, Sound Connections’ longstanding programme supporting music projects for children and young people in London. If you are working with people age 0-25 in London through music then you can apply for support and investment of up to £2000 to explore new ideas and approaches to working with children and young people. Providing funding, project mentoring and support, Innovate is particularly aimed at individuals and grassroots organisations looking to launch or incubate a project idea and develop fundraising skills. Last year, Innovate supported a choir for young carers in Brent; a music technology ensemble for disabled young people in Lambeth; early years music making in children’s centres in Greenwich and Lewisham; and music workshops for hearing impaired children under five in Camden. The deadline for applications is 5pm on Friday 15 March 2019. We encourage all applicants to book a phone surgery prior to applying. Phone surgeries will be available until Friday 1 March. We are grateful to the National Foundation for Youth Music for supporting this work. IMPACT Bursary Programme – applications open! The bursaries can cover a range of activities from attending relevant training to receiving coaching, or doing a small piece of action research. Sound Connections can connect you to different experts, mentors or trainers to support bursary activity. At Sound Connections we support organisations to develop, adapt and change to ensure music education and opportunities become more inclusive, accessible and diverse, so we hope that the IMPACT Bursary Programme provides rare and much-needed support to develop yourself and your organisation. We know that small, grassroots organisations in particular struggle to find the time and resources for training and development, so are keen to receive applications from small projects or organisations. Everyone’s needs are different, so the bursaries can be used to find the most appropriate support for you – this is about personalised learning rather than one size fits all. What types of activity can the bursaries support? These are just some examples, so if you think you would like to apply but want to check your eligibility or discuss your options, please contact info@sound-connections.org.uk to book a phone surgery and speak with a member of our team. We are grateful to the City of London Corporation’s charity, City Bridge Trust for funding this work.